Pawel Blaszczak is a composer who has been working with Shockwave-Sound.com and our internal music publishing company Lynne Publishing, for a good few years now. 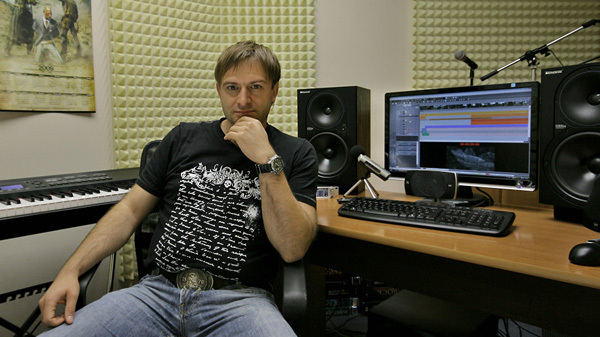 He has been responsible for producing some of the best selling tracks at Shockwave-Sound.com, including the track “Day After Day” which until recently held the position of the most often licensed track here in our music library. We decided to catch up with Pawel in his home city of Wroclaw, Poland, for an interview about composing music for a stock music library and about sound and music in general. Pawel, can you tell me a little bit about your background story as a composer and producer? I started composing back when I was 15. I was really impressed by a good friend of mine who could play the piano. I genuinely liked it so I decided to give it a go too. My first compositions were done on a piano and Commodore 64. I’m basically a self-taught though I did take private lessons in composition. Later on I bought my first synthesizer and composed on Commodore Amiga. One of my concerts was held at the students festival in the old square in Poznan. In 1998 I received my first order to compose music for a video game developed by Techland, “Crime Cities”. I’ve been bound with the company ever since and I work at Techland not only as a composer but also the Audio Director. I’ve worked on almost all games developed by Techland with “Chrome”, “Xpand Rally”, Call of Juarez”, “Call of Juarez: Bound in Blood”, but also children game series “Pet Racer” and “Pet Soccer” among others. I’ve often been cooperating with Adam Skorupa with whom I worked „The Witcher” video game and various other projects. Since 2005 I’ve been bound with Shockwave-Sound.com. I’m currently working on a horror game “Dead Island”. I’ve heard before that you played different instruments including guitar, but I’ve noticed in your latest tracks that you seem to concentrate a lot on the sound of the piano. Can you tell us a bit about which instruments you prefer, and how you feel that the different instruments work in different types of music? The piano is my primary instrument. I love that sound and the possibilities it gives me. Currently I compose most of my tracks on the piano and it is my first choice. I used to compose a lot of music for synthesizers as well as electric-orchestral music. In the nineties I really enjoyed the sound of Limp Bizkit and Rammstein so I started to learn how to play the guitar. I’m doing best with the riffs on my 7-string Ibanez with the Mesa Boogie amplifier. Guitar, however, is my second favorite instrument. I know that you have worked as a composer for several video games. In what way would you say that composing for a stock music library is different from composing music for a project like a video game? Video games require composing the music in a certain specified style. For Call of Juarez, for instance, most of the compositions were guitar-based or orchestral in the styles of Ennio Morricone or Country, Blues or classical orchestra. For stock music I choose a specific overall style that suits me so, for example, light ambient and compose the entire track in this line. Or simply sit down on a given day and compose a track I’m in the mood for usually it’s in one of the styles of stock music. Such approach allows for a lot of freedom to compose a track that feels right for the inspiration and mood one has on that particular day. So if I’m in a good mood I will compose a light and pleasant track, if my mood is slightly off I’m inclined to compose a more dramatic and dark track. This is, of course, more in respect of the draft of a track. Afterwards the production process begins and that draft is polished to create a full-fledged work suitable for publication at shockwave-sound.com. What is the latest piece of music production equipment, or instrument, that you bought yourself? And what is next on your wish-list? One of my latest purchases is the sounds library, Audio Bro LASS Strings. Excellent sounding solo violin in the ensemble. Also, Evolve Mutations 2, an outstanding library of electronic sounds. My wish-list currently includes the tremendously interesting Korg SV1. At the moment I have Roland RD700SX for the main piano sound. However, I would like to add more variety to the piano sounds and Korg is significantly different from Roland in this respect. Moreover Korg has fantastically sounding electric pianos. It is very likely that I will also purchase the orchestra library, Symphobia 2, next year. Which two of your tracks are the best-selling ones here at Shockwave-Sound.com and do you have a theory on why those tracks sell more than others? Day After Day and Running for Freedom. Truth be told, I have no idea why these two are the best-selling tracks. They definitely count among my favorite ones. When composing tracks I always try to make them as good and original as possible. But it’s the listeners who make the final decision. I’m always glad when I create music that I enjoy myself. I always try to give the best effort and don’t cut corners in this respect. Often before the final track is composed there are several earlier versions of it. On some occasions I discarded track arrangements because I believed I could do a better job. I don’t consider stock music to be some kind of additional less valuable music. I would gladly see many of my tracks included in my album that may see the day of light sometime in the future. I keep pushing my own limits. Do you sometimes play live concerts, with a band or by yourself? Have you done so in the past? For quite a while now I’ve been toying with the idea of live concerts. I’m constantly short on time to do that. I used to play concerts and I love it. Maybe I will finally manage to make that happen. Recently I’ve been trying to discipline myself to arrange for it. I have a simple ensemble in mind: a piano, solo violin and cello. Maybe a female vocalist, single synthesizer and small drum set. As soon as I’ve managed to organize it, I’m convinced that the first concerts would be held in Wroclaw where I currently live. Which piece of work / project have you done, that you are most proud of? What is “your finest work” in your opinion? I’m proud of most of my music currently posted at Shockwave-Sound.Com. There’s a lot of my personal style in them, especially in the lighter tracks, such as Day After Day, Waiting for Tomorrow and Dance with the Wind. The music from other projects I consider successful include the soundtrack for the “Call of Juarez” series and the music I co-composed with Adam Skorupa for The Witcher. I also think highly of the score for “The Kinematograph” directed by Tomasz Baginski and “The Ark” directed by Grzegorz Jonkajtys. What music / composers / artists / bands do you like to listen to when you’re not working? I generally like to listen to good music regardless of the style or composer. It would make a long list but I mostly focus on the tracks that I enjoy rather than composers, performers or entire albums. I like Harry Gregson-Williams for the first part of Narnia and Michal Lorenc for the “Bandyta”. I like the Kronos Quartet for the score for “Heat” and Lisa Gerrard. I love BT for the “Monster” OST (Editor’s note; OST = Original Sound Track). What advice would you give to somebody who is a home / amateur composer and would like to take the step up, to have their music sold as royalty-free music and make a living on it? First of all not to treat this type of music as the kind one doesn’t have to try or make their best effort. This music has its listeners and they choose it according to their preferences. They will mostly select what they like and has music artistic value. Therefore there’s no space here to make compromises. It needs to be a very well composed music. And with that we thank Pawel for his time, and thank him for being such a great contributor to our music library. If you’re interested in hearing more of Pawel’s music, then this link will bring up a list of all his tracks, of course all available to license and download as royalty free music.